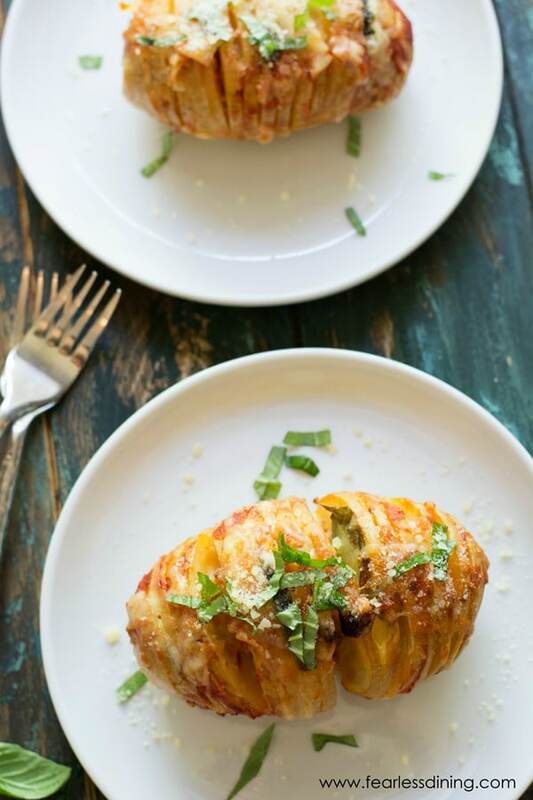 This cheesy pizza stuffed Hasselback potato recipe is going to win points with your family! Just stuff the accordion sliced potato with your favorite toppings and bake. Even your picky eaters will devour this easy dinner recipe. Baked potatoes! Every kid loves them, and they are so easy to cook. 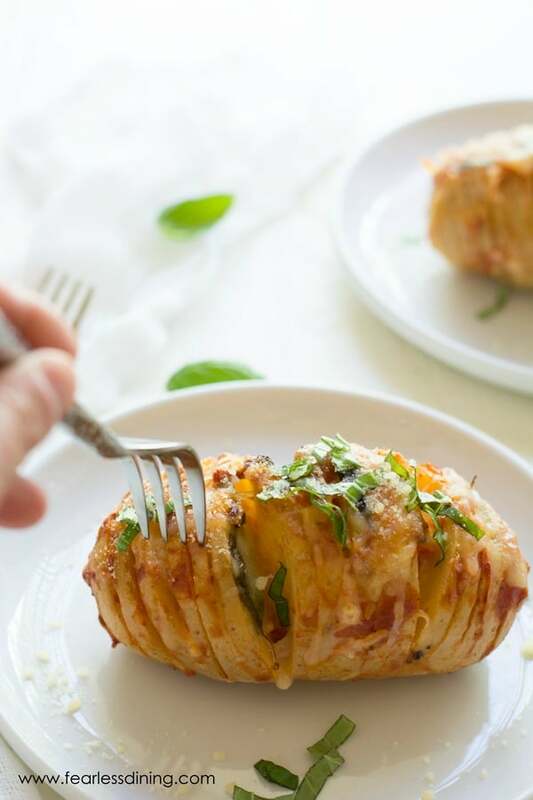 It is time to take potatoes to a whole new level with this easy Hasselback potato recipe! In the past, I have made some delicious potato recipes like these Cheesy Bacon Potatoes and these ornate Potato Roses. We found some fun potatoes at our farmer’s market today. Now we love potatoes, and I know this is one thing I can buy that my kids will always eat. My son loves potatoes and he is my “easy” to feed child. He will try anything once. My daughter, on the other hand, is picky. She loves potatoes, but only fried or plain with a little sour cream. Bland foods are her favorite. Pizza sauce is the only form of tomato to ever cross her lips. If you have a child like this, you know what I mean. I am going to try to stretch her palate a little and see if a “cheesy pizza potato” would change her mind. 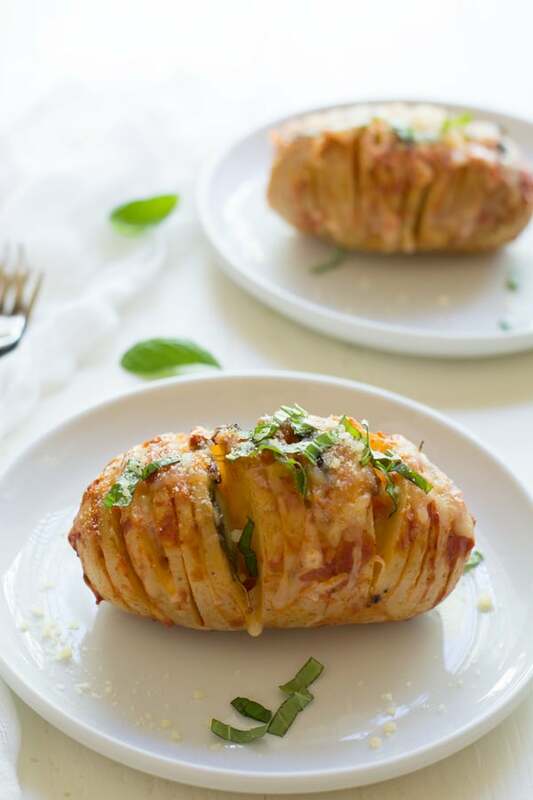 The idea came to me after seeing a million pictures on Pinterest of Hasselback potatoes sliced thinly partway, filled with butter, and baked. Could I make a pizza out of this concept? Would it even work with mini potatoes? I have to think this will be easy because it is so easy to slice potatoes thinly. 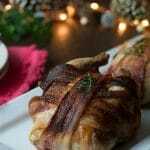 I tend to use a waxy potato variety when I make this recipe. The slices are crispier after baking than a starchy potato. 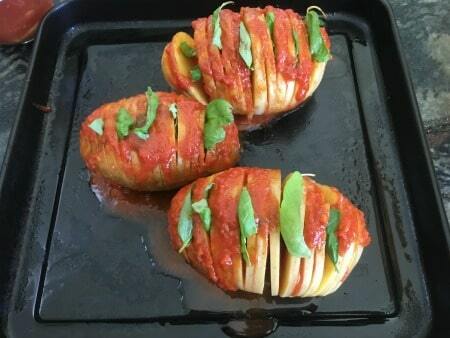 Waxy potatoes have a lot less starch and this will prevent your Hasselback potatoes from getting mushy. Yukon Gold potatoes are a nice potato that is between starchy and waxy. Finally, add some organic shredded mozzarella in between each layer of sliced potato. It can be tricky to smush cheese into each sliced layer without breaking the potato. Don’t worry if it breaks. I actually broke two slices off when I was making these. They still cook and taste yummy! Baking tip: I covered the potatoes with foil for the first 30 minutes so the cheese and sauce wouldn’t burn. Next, serve hot and enjoy! And the verdict….my daughter had seconds on this healthy snack! Success!!! 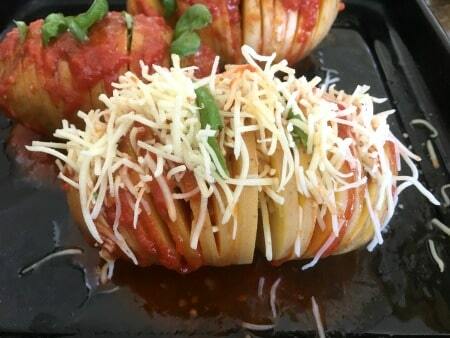 Easy cheese pizza stuffed Hasselback potatoes. Preheat the oven or convection toaster oven to 375 degrees. 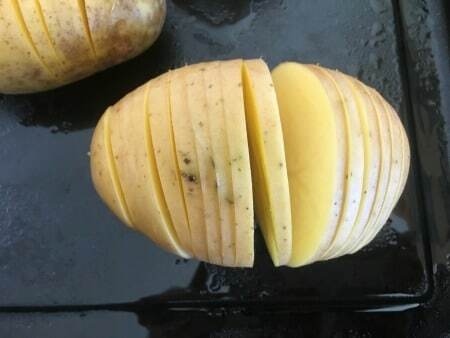 Slice each potato thinly as shown in the photo above. Use a spoon to drizzle sauce between each potato slice. Add fresh basil leaves in between layers. Add shredded mozzarella cheese to smoosh into each layer. Sprinkle parmesan cheese on top. Remove the foil and bake an additional 30-45 minutes. Sandi, this is such a fun way to change up this kind of potato. The flavors are perfect. No butter needed. You have sauce, salt and cheese all in one! These look so good! My dad loves baked potatoes and I have to make this for him. 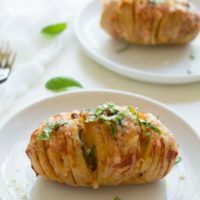 These are such a fun twist on Hasselback potatoes! And I loved seeing the old photo after your beautiful new ones! Wow! 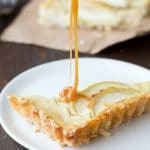 This is an absolutely genius recipe idea! It ticks all of the Autumn cravings – carbs and cheese! I love your recipes but I need to know the nutritional information as my husband and granddaughter both have diabetics and my granddaughter and myself have Celiac. Please help. 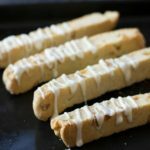 These look so yummy I think I am going to try them tonight! I don’t have a convection oven though :(. Any idea how long this would take in a regular oven? Hi Stephanie, if you use small potatoes like I did, check them in 30 minutes to see if they are soft. 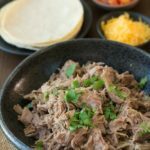 I loved this recipe, that I came across some website, so much that I subscribed to your email list. Thank you for sharing Sandi. Thank you Hady, you made my day 🙂 Have a great week. We eat baked potatoes often and my son get tired of them. I’m so happy to have a new potato recipe to try, thanks for the brilliant idea. Although these are not part of my Trim Healthy Mama plan, I’d cheat for these! You will be featured tomorrow at Savoring Saturdays when it goes live at 7 pm. Thanks for sharing! Thanks Eva. What is the Trim Healthy plan? 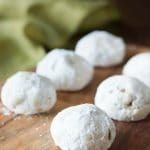 If it is avoiding dairy, we have made these with Daiya dairy free mozzarella cheese and they were great as well. What a great idea – these look delicious! Thanks for sharing! Thank you Shannon 🙂 I hope you enjoy these. I just looked at your site. I didn’t know about SF Beach Street Grill. I would love to talk to you more about it for my blog. Thanks for the idea! This looks yummy and I’m an adult. I might have to try it with some pepperoni too. I completely agree Julie 🙂 The grownups in our family loved these as well. I think we get stuck when we are trying to find things my picky child will eat. We were so shocked she liked these that I forgot about adults. Pepperoni is a great idea! Thank you for taking the time to comment. You are welcome Cheryl. Have a great week. Thank you Lisa. I was shocked my daughter liked these 🙂 Have a great weekend!